Next, our itinerary took us back to Taipei, where we visited the Meimen Center for Arts & Ethics, or 梅門德藝天地. This center – which is, coincidentally, right next to my university – is a true pearl. I was pleasingly surprised by the serene beauty of the tea house, by the architecture and decorations – which rely mostly on recycled materials, and by the soothing atmosphere inside the arts center. The centre has have a lovely restaurant and teahouse. 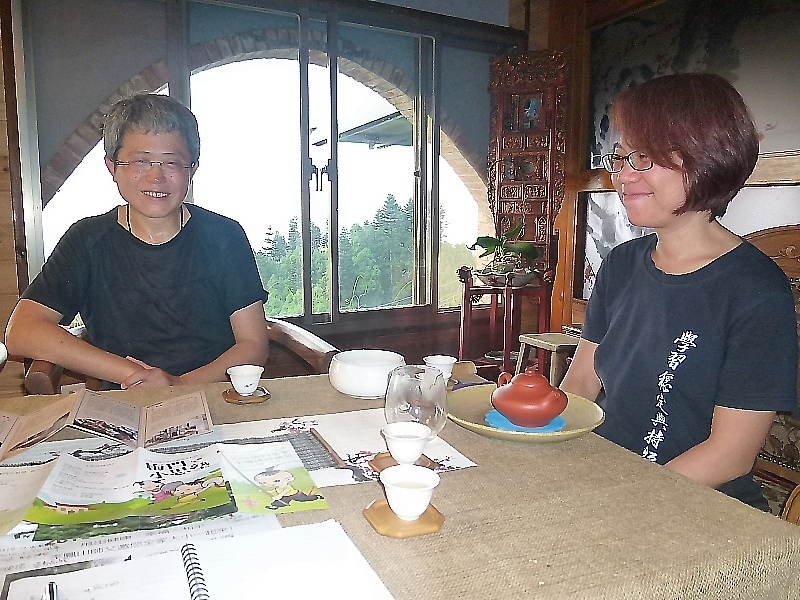 The food is prepared according to their philosophy, making for light though highly nutritious meals, while the tea is mostly organic, grown in the high mountains of Taiwan. I will certainly go back and try their delicious food and tea. Our kind guides accompanied us inside the arts centre, where we were introduced to a particular Chi gong exercise called Pingshuai 平甩, or even swinging. We were first briefed, after which we tried it ourselves, two times in a row, and I was surprised at how balanced I felt after only twenty minutes of swinging. This was my first real experience with Chi gong, and I am eager to learn more. The centre provides many classes, and the volunteering personnel is genuinely dedicated to their mission of making this world a better place through Chi gong and other traditional Chinese arts. I warmly recommend visiting the centre. After our enjoyable experience at the arts centre, we briefly visited their sister restaurant, located just a minute or so from the main centre. It is called 梅門甩茶滷, and as in the other restaurant, they serve delicious and nutritious vegetarian meals prepared with much care, and easy to digest – all of this at an affordable price.